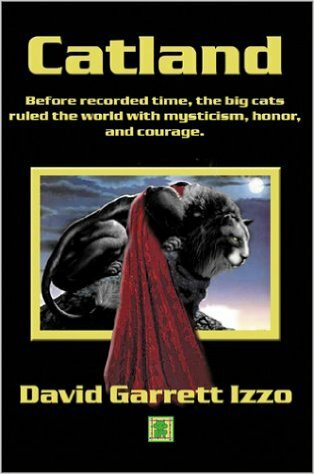 “Before recorded time, the big cats ruled the world with mysticism, honor, and courage,” goes the subtitle for Catland by White Crane subscriber and contributor (and incidentally non-gay man) David Izzo. This is a children’s book: on the surface, a piece of fluff—but quite fun—about legendary housecats the size of human beings who inhabit a world a little like Tolkien’s Middle Earth where intelligent, even psychic, animal spirits share the earth with one another, wizards, majestic eagles, and problematic human beings, and a little like the galaxy far, far away where the Light and the Dark sides compete for the power of the Force, i.e. a world of myth and metaphorical meaning. The story tells of the adventures of the head of the Council of Cats, Maximus the First, a black cat with a shiny white chest and burning yellow eyes. Maximus was stolen as a kitten and cared for in capitivity by a wise, magical eagle named Wystan and watched over by a wizard named Gerald. The first half of the book involves Maximus’s rescue by the red-and-tan tabby named Huxley and his uniting with a bride Princess Blue. The second half recounts Maximus’s conflict with the evil humans, likened toNazis with names that are cyphers for Hitler and Mengele, men who have chosen “Second Nature” (the Dark side), that is, ego and power over collective identity and common good. Izzo’s dedication at the head of the book reveals that Max, Huxley, and Princess are he and his wife’s household cats. But, of course, the names are also reminiscent of the 1940s and 50s poetry/mysticism circle of W.H. Auden, Gerald Heard, Stephen Spender, Aldous Huxley, and Christopher Isherwood. Izzo is a scholar of this period in English and American letters, having written and edited several books and scholarly anthologies on these mostly gay literary figures. Europe called A Change of Heart (to be published by gay-owned Gival Press) which examines Isherwood’s idea of the Truly Strong Man. Catland is certainly not a roman a clef, though there are parallels between the cats and their namesakes (Huxley the red-and-tan tabby is half-blind from an eye-infection like his namesake Aldous). But it is, in fairy-tale style, another examination of the idea of the Truly Strong Man—or, in this case, Cat—which is one who would give his own life for the sake of transpersonal good (what in Catland is called “Great Mystery”). I liked this little book. I thought the Nazi references clumsy, but as a cat-lover myself, I thoroughly enjoyed the images of giant housecats bounding to the rescue. Izzo’swriting is very descriptive. This book is a treat—with a truly mystical message.